Photo Credit: The Royal Order of Sartorial Splendor Blog. In its original state, the Oriental Circlet featured eleven diamond-studded Moghul arches which served as banners over opal-centered lotus flowers. In 1902, Queen Alexandra, who harbored a superstitious fear of opals, replaced the gemstones with Victoria’s rubies from 1876. Victoria was known to wear the Circlet with fresh water lilies in her hair. Prince Albert also designed three other tiaras for her, the neo-Gothic diamond and emerald tiara, the stately sapphire and diamond tiara, and the shimmering diamond and ruby strawberry leaf tiara. Today, the Oriental Circlet remains a beloved British treasure, bequeathed by Queen Victori to the Crown upon her passing. Most recently, the Circlet is most closely associated with the Queen Mother, who favored the crown for many public appearances in the last days of her life. Though she could have claimed rights to it far sooner, Queen Elizabeth was happy to abdicate possession of the beloved jewel to her mother until her death in 2002. 1. Munn, Geoffrey. Tiaras: Past and Present (London: Victoria & Albert Museum, 2002). 2. Royal Collection, The. “The Oriental Circlet.” Last modified 2010. Accessed May 9, 2012. http://www.royalcollection.org.uk/eGallery/object.asp?exhibition=RT2&exhibs=RT2gems&object=200174&row=22&detail=about. 3. Heathman. “Queen Victoria’s tiara turns up in a Highgate home.” Ham & High (January 25, 2012). Accessed May 9, 2012.http://www.hamhigh.co.uk/news/queen_victoria_s_tiara_turns_up_in_a_highgate_home_1_1186490. 4. “Strawberry Leaf Tiara.” Royal Magazine. 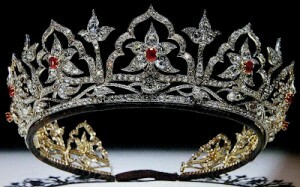 Accessed May 9, 2012. http://www.royal-magazin.de/england/queen-victoria/marchioness-carisbrooke-tiara.htm.